Ed: Jamie is 41, and a senior manager for the NHS, from Chepstow in South Wales. Jamie and Paul's 4-day, 4-corners ride aimed to raise £6,000 to be split between three charities, and also increase awareness for the work the charities do. We began by thinking that we’d spend a week on the Isle of Man watching the TT [The Tourist Trophy Race was for many years the most prestigious motorcycle race in the world.] Who’s we? Jamie Methuen and Paul Burley. I’m a new biker having passed my test only 3 years ago, but Paul has been riding for over 20 years. Paul rides a 1985 Kawazaki GPZ 900 and I ride a Honda VFR800 which is a more recent machine - built in 2008. The IOM TT proved a no-go but with the time off booked, and a touring itch to scratch we set about a good bottle of red and a map of the UK. It didn’t take us long to think LEJOG, and the same evening we called Jack Adams. Jack inspired us to plan a JOGLE journey with a twist: his suggestion was to visit the four most extreme points, a journey of around 1,500 miles, which hadn’t been done by motorbike from north to south. And so the planning began. We both try to support local and national charities by various methods and it seemed right to put fundraising at the heart of this endeavour. We chose the Teenage Cancer Trust, Care for Casualties (Army) and a local special school, Heronsbridge School Bridgend, as beneficiaries of the journey. To make it more of a challenge, we decided to attempt the four corners in four days. The following months included route planning, accommodation selection, practice rides of increasing duration, putting up a website and engaging with the charities and those who might make donations. We had some good publicity in the run up and our bikes carried the names of some corporate sponsors. On 7 June at 15:00 we set off on what we called “the positioning leg,” a straight run from Chepstow in South Wales to Stirling for our first overnight stay. We arrived at the bar of the town centre hotel (they had the beer waiting on the bar for us) at 23:45 having secured the bikes after a 386 mile run. Sunday dawned showery but mild and we took a lovely run up through Inverness and some stunning scenery and the National Park. On then to Thurso, to a lovely B&B and a friendly landlady who took us into town for dinner. Returning to the B&B we were struck that this far north, darkness never really sets in. A 7am breakfast and then we were off! Well, not quite. We’d had a few drinks the night before, the breakfast was too good to rush, and getting all our gear back into the side panniers seemed to take longer each time we packed. The short hop from Thurso put us at John o'Groats at 9am for a photo and sign off of our log by the local ferry office. Then we set off north to Dunnet Head 13 miles away, and only 24 minutes. Both locations were picturesque and the weather was splendid, but ahead of us was a long drag to Fort William with an approaching weather system and the dawning realisation that drinking in the scenery and taking photos wasn’t really an option given our schedule. Both bikes were behaving, and we’d noticed that the fuel injection system of the VFR gave it in excess of 40 miles per gallon which was better than the carburettor-driven GPZ meaning that the latter needed refilling earlier at around 160 miles. We had radios fitted to the bikes and maintained a friendly chatter throughout about the scenery and how the bikes were performing. We made Fort William with overcast skies some 6 hours and 185 miles later. So far so good, but already bits were starting to ache. How difficult can it be? we thought, its only 60 miles to Ardnamurchan Lighthouse, the most westerly point in the UK. Warning! This is wrong - see below! We pulled into the lighthouse around 17:30 - they had just closed, the rain was falling and by this point I had lost any enthusiasm for this journey. The GPZ had been running on vapour on the way to the Lighthouse and we’d had to find and fill up at the most westerly fuel “shed” on the UK mainland although the owner did give us some sponsorship money! We took a quick photo, and headed back to Fort William in appalling conditions. Rain takes on a whole new dimension when you’re on a bike! We’d planned to go on to Falkirk, but I made the decision that it was simply impossible, and luckily an old school friend now lives in the town and could put us up for the night. Time for a curry and a bottle of wine. The forecast out of Fort William was not good and we decided to wait until rush hour was almost over (such as it is in the Highlands) The first day had seen us cover over 360 miles with a few navigation errors and petrol diversions. A break in the weather was apparent and around 8:10 we set off in bright sunshine and warm weather. Today would see us traverse the UK from left to right. The first part of our journey was beautiful - the highlands, and some of the most exciting motorbiking roads in the UK, with great views and challenging terrain. We made good progress, and stopped for our first coffee at The Green Welly Stop, Tyndrum, Perthshire, having covered about 50 miles in a little more than an hour. A quick break, and we jumped back on for the rest of our Scottish trip. Ahead of us we had a further 450 odd miles from The Green Welly to East Runton just outside Cromer. Our next stop after about another 1.5 hours, was at the services on the outskirts of Glasgow. Mid afternoon came around quite quickly and the sun was making it all very serene when Paul's voice over the radio announced that he was low on fuel (again). As a biker I think this is something we get used to and most bikes have a reserve tank which can be selected. As a sometime pilot I get super-twitched when I hear or see anything which resembles a fuel “situation”. I asked, How's your reserve? to which Paul replied, That's what I'm talking about. He’d been sitting on reserve for some miles. I was lead bike on this stretch, and I took the first left. I knew the area reasonably. I'd been stationed in the Royal Auxiliary Air Force at Leeming in the 90’s and we were past there but not close to another main service station. I let Paul know over the R/T that I’d be looking for the first friendly face I could see to help us as I watched the mirrors closely for signs of Paul dropping back. I pulled over opposite a chap mowing his lawn. Why here? asked Paul. That chap has a lawnmower which equals fuel, and a car in his drive which equals more fuel, and he lives here judging by his demeanour so he knows the area, I replied. Paul came back a few minutes later with directions for a fuel stop about a mile away, which we headed off to. While Paul fuelled up I got lunch and we sat on the grass in the lovely sunshine chatting and eating. That tyre looks a bit worn, said Paul looking at the front of his bike; more of that later. Time to press on; it was after 3 and Norfolk was miles away. We'd been blessed by improving conditions south of Glasgow but another bi-product of holding a pilot's licence is a healthy distrust of the weather. I could feel dramatic changes in temperature and whilst I’ve forgotten most of the cloud formation names, what I could see looked onerous. I radioed to Paul that I'd spotted a weather front extending west to east and regardless of the route we took or the speed we could add on or scrub off, it was my opinion that we were going to get wet. And so we did. The downpour was dramatic and took about 20 minutes to pass through, enough time for the bike to dry me and itself out. We rejoined the A-road into a sea of spray which was a bit 'sporting' and I told Paul over the radio that despite this, at the first opportunity we needed to make up time. Nature was with us and as we came down through the midlands and onto roads I recognised, the sun came out and we picked up the pace. As we rode south east the weather continued to improve into a "gin clear' blue sky with the sun heating my back through the leathers. Gradually the horizon flattened and we began to enter the distinctive landscape around Kings Lynn. This was lovely biking weather, and we began to claw back time as the sun shone, the early evening set in, and the roads tuned to A-road country specification with loads of tractors presenting some splendid overtake situations. Paul and I had settled into a pattern where we would both fuel up at the same time, and while he was taking the opportunity to put more fuel in, (remember, he was burning more than I was by virtue of the age and technology differential of our two bikes) I would jump off and pay the fuel bill and have time to text our next destination to update them on our ETA. The final part of our journey on this day was blessed with continuing sunshine, and by virtue of being on a bike with good visibility we made good time and rolled into the driveway of our overnight stop in East Runton some 20 mins ahead of our ETA at 20:10. We were almost helped off our machines by our friends who escorted us into the garden to a BBQ and beer. On its own this would be just enough but our host for the evening is a master butcher trading in Cromer and Sherringham, <icarushines.co.uk>. We finally fell into bed around midnight having been on the road for 12 hours plus, and ridden for (according to my speedo) 499.6 miles. One of the things we'd noticed on this trip was good plans often need 'reviewing' and so the next morning with the promise of great conversation, good coffee and more of Icarus' meat for breakfast, we simply couldn't rush off. Around 8:45 we did set off but only for the short hop to one of the Icarus Hines shops in Cromer for some PR shots. Our friend, Robert Richmond, had meanwhile sorted a new tyre for Paul through his connections at Cromer Car Centre but before we set off for some new rubber we made our way from Cromer to the most easterly point in the UK, Lowestoft Ness. We pulled in after a short 'tour' of the area looking for a star located in the concrete overlooking the coast - it's a fairly bleak and uninspiring place. We noticed that we were closer to parts of Europe than we were to home! In the local maritime museum our story was met with enthusiasm by the local volunteer staff who stamped our book and bade us bon voyage. Off to Norwich where a suitable tyre for Paul's 'vintage' bike had been located. Whilst the bike was sorted we located some good coffee and I updated our tweets, Facebook messages and rough journey stats. Setting off, all seemed well for about 200m, when Paul radioed to say he had a problem. Somehow the speedo cable hadn't been properly re-attached and we returned for another 20 minute re-work of the front wheel, setting off again south-south west behind time. We'd planned to make it to the Ace Cafe in London, a biking mecca, and did so around 15:30 in need of coffee and lunch. This was the point at which the tiredness really showed. We hardly spoke through lunch and it's a testament to our friendship that we knew words weren't required. By the time we were ready, traffic was already building and its fair to say the next hour was a pain as we dodged and weaved school traffic around London - not good. Our next destination was Brighton where we were due to meet some of my family at Brighton fire station. Compared to our seemingly rapid progress though Norfolk the previous day, this journey seemed to drag on. We rolled into Preston Circus around 18:15 and were welcomed by cold drinks and a fire tender ready to hose down our bikes. The next leg was one I'd looked forward to. I knew the road well which would take us along the A27 skirting Shoreham (where I'd learned to fly), then Goodwood, Southampton, then on to the New Forest. We made good time as the traffic improved, the A-road became motorway, and the sun set. The air cooled as we dropped into the outer reaches of the New Forest and the miles clicked down as we approached Chewton Glen. Five minutes later, we were sitting on the driveway of our next overnight stop at a friend's home, and the smell of bolognese and the sight of a cool beer took on almost biblical significance. We knew that if our gods were with us, today would see the end of our challenge. I think, as we munched through cereal and said our goodbyes to our hosts, we silently reflected on what we had achieved so far. We had covered quite a few miles, and for a novice rider, this was no mean achievement. From Paul's perspective, I think he had begun to realise how having a lesser-experienced person riding can slow down decision making and progress. We'd also realised that covering this number of miles in this short space effectively cancelled out any opportunity for sightseeing, journal making or even photography. With the exception of the stop in the highlands cafe, we hadn't really admired our surroundings. A little after 9 we set off from BH25, heading west with the sun on our backs. We had a loose plan to stop off at Jamaica Inn, although I'm not sure how Paul thought he was going to navigate us there - I had the GPS (a last-minute thought to replace the packet of paper maps I'd printed out - good call! ), and he was having to cope with an increasingly unreliable speedo since the 'fitting mistake' in Norwich. We set off towards Exeter and then south west aiming for Lizard (the most Southerly point in the UK). As we approached Lizard I could smell aviation fuel, and looking skyward, I noticed a HAWK trainer manoeuvring at about 1000 ft, meaning we were close to RAF Culdrose. The view of the airfield and the coast made for a pleasurable 10 minutes as our journey towards Lizard closed down. The last few miles of country lane led us to a gravelly car park on an incline just up from the Lizard National Trust visitor centre. I was absolutely shattered, and looking at the way Paul eased himself off the bike, he was too. Paul had entered the car park ahead of me and I watched him gingerly negotiate the uneven gravel surface. Bikes are great when they are upright and moving but try moving one around under your own steam on a loose surface. I almost gave up and parked at the top, but pride got the better of me. As I came to a halt the VFR showed its first sign of displeasure. We'd encountered slow traffic coming through the village and engine temperature was up to 105 degrees as I edged down the cramped slope into the overfull car park. The cooling fan and the engine were coughing as the outside air temperature moved to 25 degrees. My needs were basic: icecream! So I dispatched Paul to find someone to sign off our log book whilst I found some change and set off in search of calories. Paul was nowhere to be seen so I wandered down the path and bumped straight into him. He introduced me to the local NT warden who wanted to know all about the trip, and offer us a seat in his cool hut. So, we'd achieved our ambition of visiting the 4 most extreme points of the UK - but our trip wasn't over yet. In order to complete the LEJOG challenge we had to check in at the Land's End visitors centre. I could have happily laid back on the grass at Lizard and let the hot summer air wash over me, but we knew we had an evening engagement and we had at least an hour's ride ahead. We made our way following signs for Land's End, rolling in around 16:30. We were surprised by the somewhat insincere look of the place, although I'm not sure quite what we were expecting. A quick conversation with the hotel reception, and we were directed to ride our bikes down toward the official sign post for a couple of quick photographs, and some texts home to let family and friends hear our news. In all, we'd been on the road completing the challenge (so excluding the positioning ride) for 4 calendar days, over 8 hours per day. The dawning realisation that the expectations of our own schedule left little or no time for sightseeing, and every night we'd be dog tired. One cautionary note too: the roads to Adnermurchan are far from easy to navigate even on a narrow motorbike. You should allow yourself double your estimate and then add a margin to that on top. I've mentioned the roads to Ardnermurchan, but they're worthy of a reminder - they really are very narrow, barely passable by 1 bike and a car. The surface, while good, collects a lot of debris which on a motorbike turns the road into the equivalent of riding on ball-bearings. I had a brief excursion into the heather, which on a bike weighing over 240kg, out of balance with panniers, was my least favourite biking experience to date. The scenery at Dunnet Head on a good day is amazing. Get there early to avoid midges and crowds, and breathe in the Scottish air. I'd start at Dunnet Head first - you're not going to get anyone to sign your logsheet because the lighthouse is automated and the old lighthouse keepers' cottages are now private residences. We took a photograph which was auto-date-stamped. Go from there to John o' Groats where, if you time it right, you'll again beat the crowds, and in between ferry departures, the local ferry office will stamp your sheet with a pleasant smile. The reality of roads is that in Scotland, at least the Highlands, everything resembles a 'non-motorway' and you should take your time to see the sights, especially north of Inverness. There are some lovely motorbiking routes, and if I did this again I'd probably take 3 days just to do the Scottish leg. We popped into Thurso for evening dinner before setting off. It's a town dominated by the nuclear industry, where, in the summer months it rarely gets dark. There is some lovely scenery along Fort William, down past Loch Lomond, not to mention through the Highlands. Once you get close to Glasgow, it's far more motorway oriented. We had to deviate from our 'non motorway' plan at this point to pick up time, so again, if you want to stick to "non-M" you'll need to factor in time. The A1 down through Yorkshire is a bit of a conundrum. I drove this many times when I lived and worked in the North East. It’s fast, dangerous, clogged, but quite beautiful in places. I think on reflection, we should have avoided this road. If you are riding a bike, and its not a 'sit up' variety, your neck will began to hurt mid way through the second day especially if you have ridden up to start your challenge. Whatever you do, factor this in by either adjusting your handle bars with risers, taking time off the bike or booking a massage. Be prepared to be underwhelmed by Land's End. Take your photos, raise a glass, and get the heck out - we rode to Newquay to meet some friends for a celebratory bash. 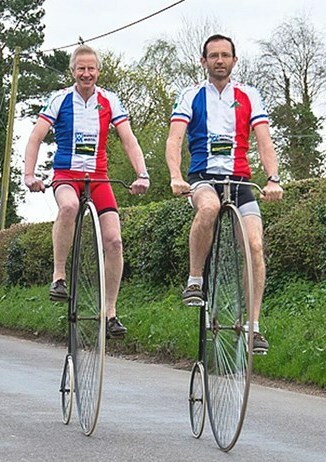 A Tandem or a Tricycle - Which Set a New Record? This article is loosely based on two which appeared earlier this year in different issues of Cycling Weekly. The first was about an attempt on the End-to-End record for men’s tandem. It was entitled “No end to End to End tandem quest” and took place on the 4th/ 5th May. The challengers were Glenn Longland, a no-nonsense long-distance time trialist and his pilot Dominic Irvine. They had planned their attempt meticulously and had worked out their precise route complete with timings. 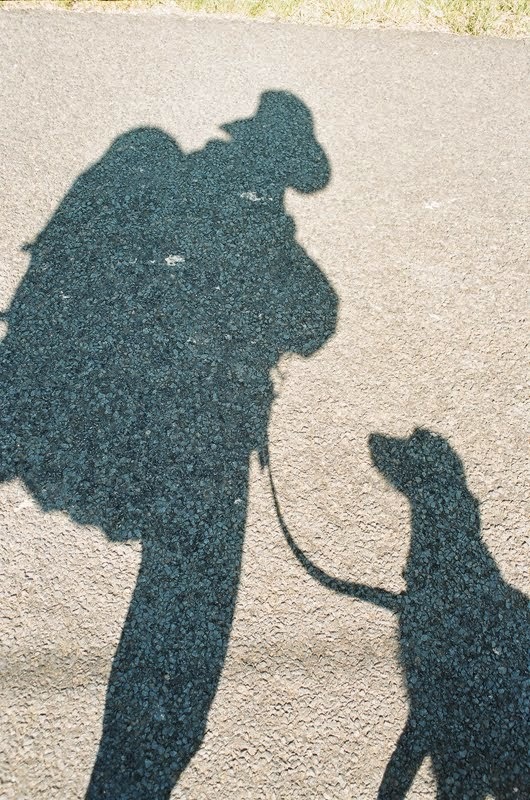 They were followed by a support team of several cars, helpers, timekeepers, a doctor and a photographer. Their tandem was custom-built by Orbit and Irvine had calculated the ride down to the last detail and estimated they would turn the pedals 250,000 times and each would burn 19,000 calories. They left Land’s End at 6am on the 4th May and hoped to beat the 48 year-old record. However, after almost 26 hours of riding and 457 miles, their attempt came to a halt in a lay-by just north of Penrith. Fatigue and lack of compatibility had taken their toll. Longland collapsed on a grass verge in need of oxygen, a drip in each arm and a trip to the local A&E. Although both were good cyclists, they were not an effective team and with two riders more things can happen, right down to comfort breaks. The pair seldom picked up much of a tailwind and had to ride through chilling fog in Cumbria. Longland churned out the miles and stuck to his diet of a rice and fruit salad smoothie, Eccles cakes and sandwiches whereas Irvine, with all the technology aimed to ride the distance at a precise wattage of 240. Therefore the record set on the 8th June 1966 by Pete Swinden and John Withers of 50 hours, 14 minutes and 25 seconds still stands even though there have been nine attempts to beat it, including mixed tandems, none of which has succeeded. Olympic rower James Cracknell tried and failed twice, once with Rebecca Romero and once with Jerone Walters. 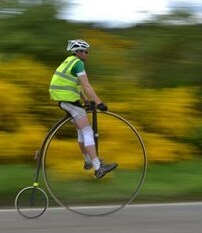 Although a tandem should go faster than a solo bicycle, the record for the latter is over six hours quicker. Gethin Butler set it at 44 hours, four minutes and 19 seconds in 2001 (before he continued, to break the record for 1000 miles). 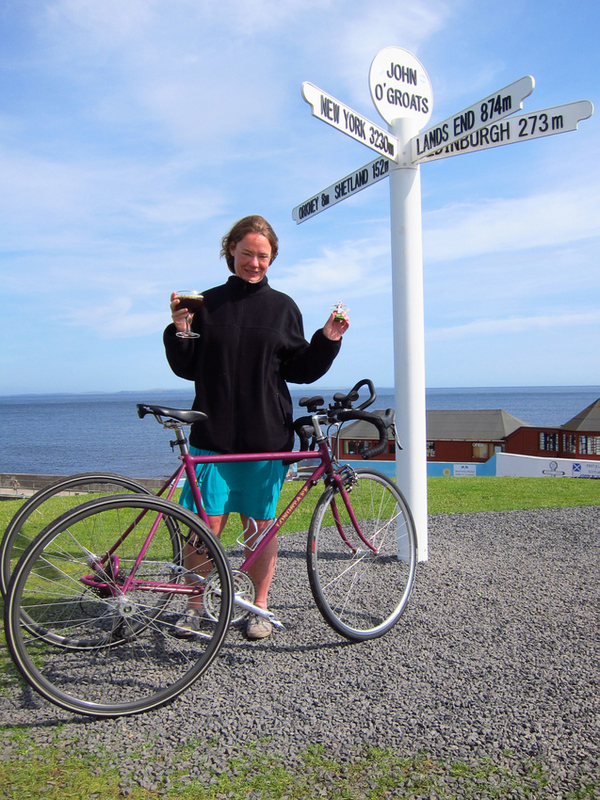 The second account covered a new record set on the 7th August by 47 years old Jane Moore who became the first woman to set a record for riding a tricycle from Land’s End to John o’ Groats. She rode 849 miles in three days, 16 hours, 45 minutes and 12 seconds. Nobody had attempted this before and it was suggested to her by the father of Lynne Taylor who currently holds the women’s solo bicycle record. Moore was formerly an ultra marathon runner with a history of long-distance endurance events. Saddle soreness scuppered her plans to continue on for the 1,000 miles trike record but she is planning to try again and then do the 1,227 kms long-distance classic, Paris-Brest-Paris. Her nutrition tip: pasta, vegetable soup, peanut butter and jelly babies... The things people get up to! Jane Moore, with celebratory tipple. 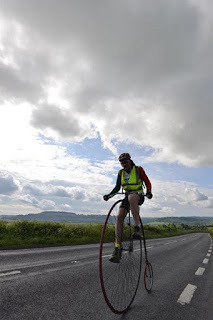 This May, Andrew Donald and Chris Saltrick cycled LEJOG on antique Penny Farthings to raise money for Cancer Research UK. They accomplished the distance in five minutes short of 12 days, and raised more than £13,000. Ed: Long-standing member John Blanchard did his first LEJOG in 1953, when he was 20 (and as John pointed out, thirty years before the Association was founded). This puzzle is similar to those of Geoff De'Ath. In this case the 18 words in column one need to be correctly paired with a word from column two. This will leave an unused word remaining in column two. I realise that members in the southern hemisphere suffer a slight disadvantage because of the nature of the seasons (and I have to add that one pair of words relates to an all-year-round food) but otherwise the pairs all form expressions connected with Christmas/Winter/December. [Editor's introduction: Meriel's late husband Bill was a member from 1998, when he drove from John o' Groats to Land's End on a B.S.A. Bantam motorbike, via Lowestoft Ness (East-most point), and Lizard Point (South-most point). His friend accompanied him in his car as back up. By the time they realised they hadn't included the furthest West point, they had already booked their holiday time from work, so they couldn't fit it in, as it added about 3 days! An article was then published in Quo Vadis? about his "Box the Compass" ride. Meriel told me she had planned to go with Bill in 2005 (or maybe 2006?) on the back of his modern Royal Enfield bike, but she had a stomach bug on the start day so she sent him off without her as she couldn't face changing all the B&Bs. She joined him at Perth, and they travelled together from there to Lands End. Then Meriel could say she might be the only person who hadn't started the run but finished it! In 2013, Janet and Derek Bootyman and I did the trip together again, with Derek doing all the driving. Many thanks, Derek. We arrived at John o’ Groats on Wednesday 18th September at about 4 p.m. We checked into Sea View Hotel and saw several others from our group who had already arrived. As it was wet and windy we drove the short distance to John o’ Groats and looked around the shops and had a cup of tea. We went back to the hotel for a break before meeting everyone for dinner at the hotel. It was good to see old friends and acquaintances again and to meet other members we had not met before. After a delicious meal and plenty of chat and laughter we went off to get some sleep before our journey began. We all met at John o’ Groats after breakfast for a group photograph before setting off. Derek had decided not to use any motorways for the trip. We had done this on our trip in 2011 and we all agreed it was more interesting and Derek said a lot less boring for him! Last time we had gone to the East and so this route was new to us. We drove through some lovely scenery. We had decided to stay in B&Bs and our first B&B at Fort William was set in its own grounds with views of Ben Nevis. It was a bit shrouded in mist while we were there but still beautiful. We arrived in the afternoon and had time to look around the town before going to the B&B, Torbeag House. We were amazed at the lovely views of the loch from the High Street. We met others from our group also exploring the town. We had a good evening meal at The Moorings Hotel, just down the road from our B&B and by the Caledonian canal and the Caledonian Steps, the 8 locks on the canal. After a hearty breakfast we left the B&B on Friday morning and stopped to look at the Caledonian Steps and have short walk along the canal. We realised what an amazing piece of engineering it was. On Thursday we had crossed the canal and waited while the swing bridge opened to let a boat through. Our route to Carlisle was very beautiful with varied scenery including mountains, lochs and woods. We drove alongside Loch Lomond and so, of course, quoted “we’ll take the high road …”. As well as going through expected places we also saw signs and drove through some very distant places such as Alexandria, Dunkirk, Virginia and Botany Bay. Fortunately we were not asked for passports and it did not add to our mileage or journey time! We had another good B&B in Carlisle, within walking distance of the town. 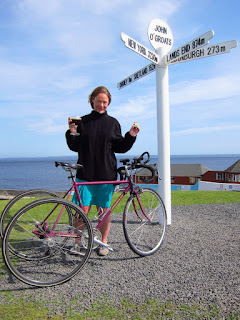 When we told the owner what we were doing he said they have a lot of walkers and cyclists doing Land’s end John o’ Groats but he had never heard of the Land’s End - John o’ Groats Association. We gave him the website address and he said he would look it up and pass on the information in future. After another hearty breakfast we left Carlisle on Saturday morning and set off for Gloucester. Our route took us near Shrewsbury, Bridgnorth and Kidderminster. We spent the night at a Premier Inn outside Gloucester where we had stayed in 2011 and were able to book rooms at £38 per room! On Sunday we had another pretty trip to Land’s End. We passed Jack and Theresa and their friends on the A30 and later they passed us! We arrived at about 4 p.m. and it was a lovely sunny afternoon with blue sky and sea. In 2011 it was very windy and dull and we almost blew away! It was lovely to see it calm and sunny. After the group photograph we went to Hayle to join everyone at the Premier Inn for dinner, and we were joined by some four people who had not been able to do the whole trip. We were presented with our special medals for the anniversary trip, and chatted about our journeys together. After breakfast we said our goodbyes and set off for home. We did use motorways for this! Many thanks to everyone who helped to organise the 3013 trip, a very memorable occasion for our 30th Anniversary.